The Chapel Hill/Orange County Visitors Bureau is here to help with your media request and can provide the following services. Itinerary development, story ideas, facilitating research and one-on-one visits to local museums, attractions, restaurants, hotels, shopping destinations, festivals and events for qualified media. Provide background information on Chapel Hill and Orange County including attractions, accommodations, restaurants, meetings and conventions, shopping, entertainment, arts and culture, sports, history, tourism stats, travel-related services and trends. Fact checking stories and articles containing information on Chapel Hill/Orange County. Organized group and individual press trips throughout the year. The CVB can coordinate admission into area attractions, events, performances, festivals, tours, etc. to journalist whose name appears on the byline of the article. The CVB will work through area restaurants to obtain discounted or complimentary meals. This is not a guarantee, and writer will be responsible for balance on meals. In some instances, a gift card will provided, and the journalist will be responsible for costs exceeding the amount of the gift card and tip for waitstaff. The CVB will work to provide complimentary accommodations for journalists on assignment. If journalist is not on assignment, the CVB will work through area hotel partners to offer a complimentary or media rate. Generally, the CVB does not provide airfare, nor do we provide complimentary rental car services. We will work with you to obtain appropriate contacts, interviews, photography or b-roll. If on assignment, please forward Letter of Assignment. Based on strict copyright restrictions with the Bureau&apos;s photographers, these photos are only to be used by members of the media for editorial purposes in print, broadcast and online articles promoting the Chapel Hill/Orange County NC area as a leisure or meeting destination. Images are also provided for publicity and/or attendance promotion. Photos cannot be provided for and/or used for Commercial purposes. If you are looking for a particular shot that you don&apos;t see displayed, please let us know; as this is only a sampling of the images available. 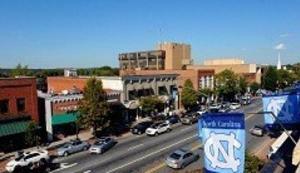 Photos used must be credited "Courtesy of Chapel Hill/Orange County Visitors Bureau" unless otherwise noted. If you would like to receive a media kit, be placed on our media mailing list or need other assistance, please email Communications Director Patty Griffin or call 919-245-4321.